Manufacturing Today featured a four-page article on Rulmeca Corporation in its first issue of 2019. It describes how the company grew from its 2003 beginning and elaborates on the large expansion the company made last year. 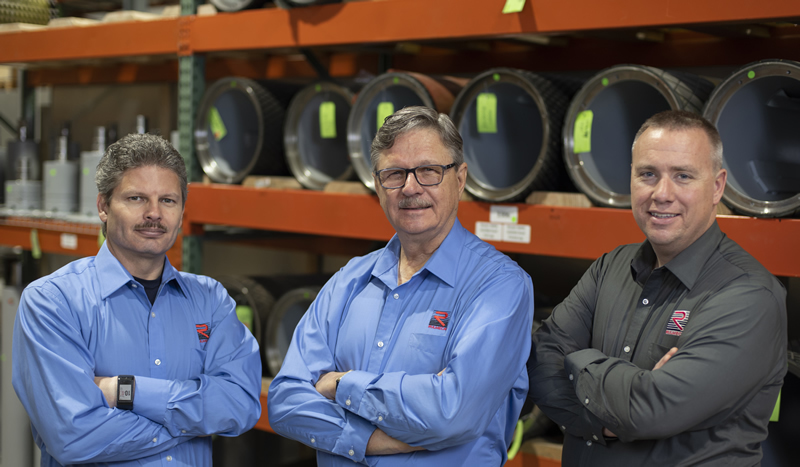 From left to right, Jay Graham, director of operations; Mike Gawinski, president; and Brian Vrablic, director of sales and marketing, all contributed to the article. Click here to read full article. Charlton Jernigan, production engineer, removes a stainless steel shell from the the company’s CNC machine. This machine enables Rulmeca to offer a variety of Motorized Pulley shells for food processing and package handling applications. An extended overhead crane system, expanded repair area, as well as the CNC machine, necessitated the move to a new larger building in August 2018. The new larger building enabled the company to completely revamp the stock of Motorized Pulley parts. Casie Moore, motorized pulley repair technician, places new motor rotors into the new parts rack. Pete Svizeny, motorized pulley assembly technician, performs a “no load” current test on a model 320M Motorized Pulley using one of the seven new test stands/ assembly fixtures. Merle Graham, motorized Pulley assembly technician, assembles a stator in the new six-position assembly fixture. The multi-position fixtures enable the company to assemble large orders more efficiently. The article describes how Jasper Engineering sent two technicians to Rulmeca after Hurricane Florence to help the company catch up on production. For more information about Jasper Engineering, click here.